In October, I went to a lot of conferences to speak and sell books. The great thing about these opportunities is that not only do you meet new people and get your name out there, and hopefully a little cash, too, but you also get to hear professionals talk about writing, their works, and their philosophies and quirks. I thought I'd share with you some of the wisest advice and touching moments I experienced this last month. 1. Ozark Creative Writers Conference, Eureka Springs, AR: Jim Donovan is a literary agent, who represents a lot of non-fiction writers (and fiction, too) who are bestsellers. He's been in the business for 20 years, and he's from Texas. He had a secret for every writer in the audience, whether they just started last month or had been writing for years. The best way to have success in this business: learn your craft and become a better writer. I know it sounds so simple--why didn't I think to say this? I think it's because I make things way more complicated, and in reality, it is a bit about timing and networking. But ultimately, if you learn your craft and write well, you will have success. Jim reminded us that this is what our careers are all about! 2. IBBY Conference, St. Louis, MO: The International Board on Books for Young People had their conference in my hometown this year (on the same night the St. Louis Cardinals beat the LA Dodgers!! ), and I was asked to participate as a local author. I jumped at the chance. At the dinner, I got to hear 90-year-old picture book author Ashley Bryan speak and get the entire audience to chant poems with him. His energy was catching. His spirit was amazing. His love for children and the written word was admirable. I can only hope that I have that spirit, zest, and work ethic when I'm 90! If you don't know about Ashley Bryan, look here. This is one of the poems we all chanted! 3. ILSMA, Springfield, IL: The Illinois Library School Media Association had their annual conference in Springfield this past weekend, and I was lucky enough to get a proposal accepted for a workshop and participate in an authors' breakfast and panel. It was a great experience, but what made it even better was the speech that middle-grade author Sharon Draper gave about her book, Out of My Mind. 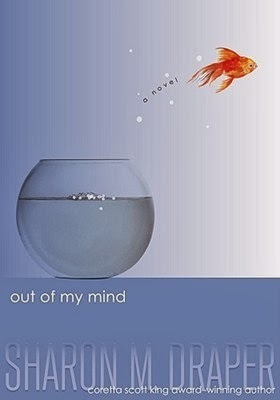 This is a book where the main character is Melody, an 11-year-old girl in a wheelchair who has a photographic memory, but no one knows it because she doesn't speak. I can't wait to read the book, but the best part about Sharon's speech (besides her very funny story about how United Airlines almost left her stranded at her home airport) was a letter she read from a boy who had read her book. I will have to paraphrase, but basically the letter asked Mrs. Draper if she could adopt him and be Melody's big brother to help protect her. He knew that Mrs. Draper wrote books where kids had a lot of problems, but in each book, those kids had someone to love them. The young man shared that he had no one to love him at his house, and that's why he wanted Sharon to adopt him. It was one of the most touching and heartfelt letters I had ever heard from a kid. That's why children's writers write books. That's why we should all write books--to touch someone else in the world. I hope something I shared with you today helps you. If you've heard great advice at a conference, please share it with us! Margo Dill is the award-winning author of Finding My Place: One Girl's Strength at Vicksburg, a middle-grade historical fiction novel. 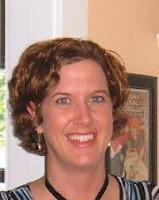 She also has two picture books and a YA novel under contract and teaches novel writing for WOW! Thanks for sharing the tips, Margo! I love writer conferences! You just learn so much and come away inspired. Would make it a full-time job if I could. On my writer's bucket list. Great tips and insights. Bliss. To be that vibrant at 90--totally inspiring!